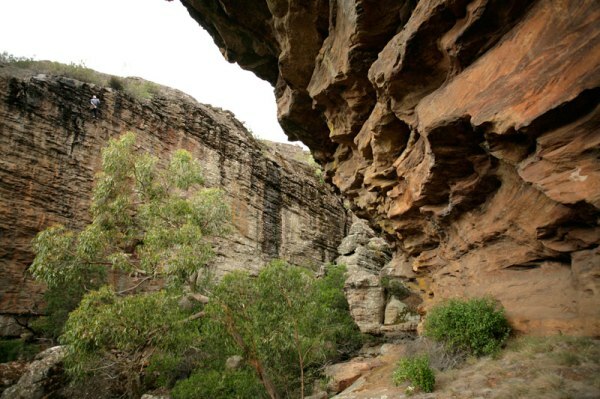 The Ravine is one of the most popular easy sport crags in the Grampians. When it was developed in 2008/09 though it came under fire from a variety of locals and other user groups. The area was as noted ‘grid bolted’. This didn’t win any non climbing friends for a start. Another concern was the driving in along the access road – the end result was a very eroded road (a number of people were bogged) and a growing number of cars and by one report a mini bus. There were concerns that the area would become a very busy haven for groups.This issue was taken to Parks Victoria by concerned residents and local user groups who demanded an end to climbing and removal of bolts in the area. After much discussion between VCC/CliffCare, Parks Victoria and the concerned residents, an agreement was reached whereby a gate was put in place to stop the vehicle traffic in. Climbing could continue but climbers were required to walk in from the start. This would limit the amount of people accessing the area and hopefully turn away any larger groups that may come in by minibus. Please respect the gate and its purpose being to restrict people from driving their cars in to park closer to the access track. At various times this gate has been unlocked,sometimes open. This is not an official opening allowing any vehicles in – it is usually residents needing access for fire concerns. The gate was an outcome of climbers working with residents and land managers so please be respectful. Park outside of it and make the walk in. Location: From Stapylton Campground drive west along Olive Plantation Road towards Grampians Road. Park at the first left turn after about a kilometre at a sandy hump with a gate. These locked gates were recently installed at either end of the sandy access track (February 2009) so now you have to walk (not drive) south for aprox 2.5 kms down the sandy fireroad the runs on the east side of the olive plantation (parallel to Winfield road, but further east).